Flashpoint now has directors, with Spider-Man: Homecoming scribes John Francis Daley and Jonathan Goldstein officially signing on, and Ezra Miller set to reprise his role as Barry Allen. But who will play the Thomas Wayne version of Batman in this big screen adaptation? That's the mystery right now, and Jeffrey Dean Morgan says he'd love to jump into the Batsuit, which is no secret. The actor has hinted at his involvement since last summer when the Flashpoint movie was first announced at San Diego Comic Con. In a recent interview, Jeffrey Dean Morgan was asked if he was aware of the source material for the Flashpoint movie, to which the actor revealed he is very familiar with the storyline. Additionally, Morgan admitted that he and Zack Snyder had talked about him portraying The Caped Crusader back in 2009 when they were working on The Watchmen. Morgan also revealed that the character is a favorite of his and Snyder's. He explains. "Look, I'm not going to lie. Zack Snyder and I talked about doing Batman together when we did Watchmen. I think it was both he and I's favorite character and favorite story. And what I know about the Flashpoint Batman is, you know, for me, I think he is not only the darkest of the Batmen, but the coolest. And I love his whole storyline and who he is and the tortured soul of it all." As for whether it will happen or not remains a mystery at this point. Jeffrey Dean Morgan played Thomas Wayne in Zack Snyder's Batman v Superman, which makes him the obvious choice. However, it's not clear what exactly DC Films will want to do after the debacle of Justice League. The studio may decide to shy away from anything Snyder related at this time. When directly asked about the situation, Jeffrey Dean Morgan had this to say. Related: Is The Flash Movie Really Shooting in Early 2019? "We'll see. I mean, look, DC is DC and they'll figure out what they're going to do next. But I'm highly aware of the character, I will say that. I'm highly aware of the character, and it would probably be a thrill of a lifetime to put on the Batsuit." In the Flashpoint storyline, Barry Allen goes back in time to prevent Reverse Flash from murdering his mother. In the process, Allen alters the fabric of time and throws the DC universe into an alternate timeline that sees Bruce Wayne die instead of his parents. His father, Thomas Wayne, ends up becoming Batman and Martha Wayne later ends up as the Joker after a mental breakdown. Thomas Wayne ends up as a more brutal version of the character, a trait that would suit Jeffrey Dean Morgan quite well. 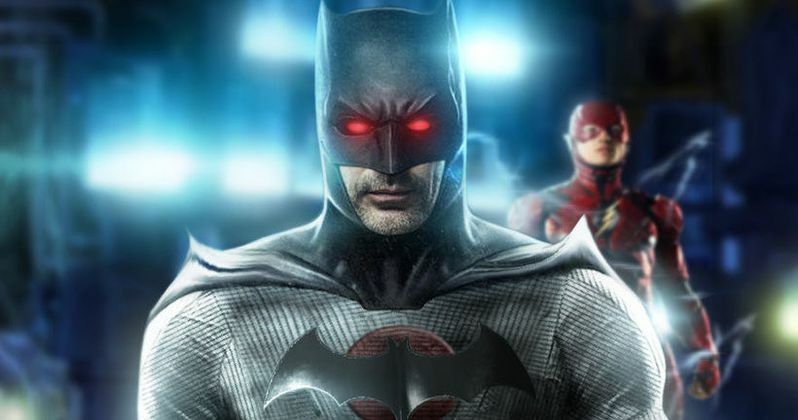 Fans are holding out hope that Jeffrey Dean Morgan will end up as Batman in the Flashpoint movie. The idea behind it is almost too perfect, but as previously noted, it's not clear where DC Films and Warner Bros. are going to decide to take the project. However, Morgan seems to be primed and ready to take the role on and he's definitely excited at the idea of it happening. You can read the rest of Jeffrey Dean Morgan's thoughts about becoming the Thomas Wayne version of Batman for the Flashpoint movie over at Total Film.